1. Bluestone Bridge, Summers County, W. Va.
Bluestone Bridge, Summers County, W. Va. 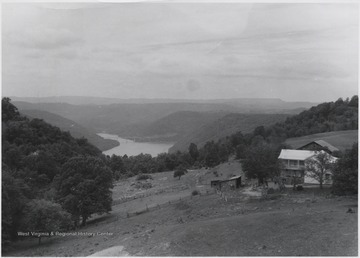 Distant view of the Bluestone Bridge in Summers County. 2. Bluestone Bridge, Summers County, W. Va.
View of post under Bluestone Bridge in Summers County. 3. 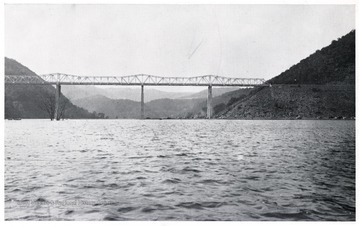 Bluestone Bridge, Summers County, W. Va. 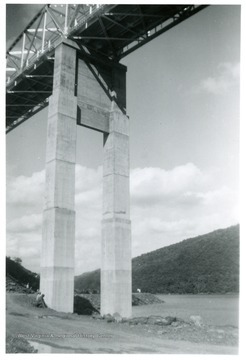 Partial view of the Bluestone Bridge in Summers County. 4. Bluestone Bridge, Summers County, W. Va.
View of the Bluestone Bridge from underneath. 5. 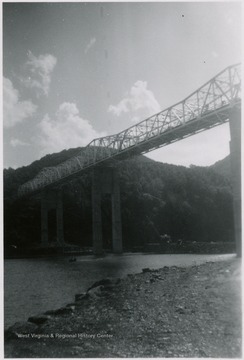 Bluestone Bridge, Summers County, W. Va.
6. 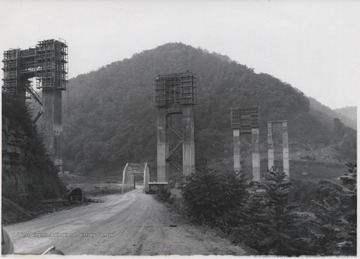 Bluestone High Bridge Under Construction at the Mouth of Bluestone River, Summers County, W. Va.
Bluestone High Bridge Under Construction at the Mouth of Bluestone River, Summers County, W. Va.
Large supporting structures tower over a smaller bridge connecting a dirt road. 7. Lilly Bridge Over Bluestone River, Summers County, W. Va.
Lilly Bridge Over Bluestone River, Summers County, W. Va. 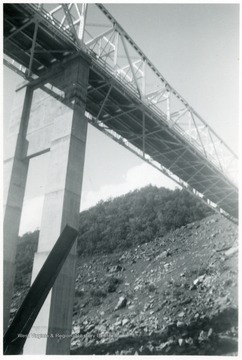 The bridge was formerly known as "Bluestone High Bridge" before its name was changed to what it is today. The structure stands tall over the river. 8. Bluestone High Bridge in Distance Spanning Mouth of Bluestone River, Summers County, W. Va.
Bluestone High Bridge in Distance Spanning Mouth of Bluestone River, Summers County, W. Va. 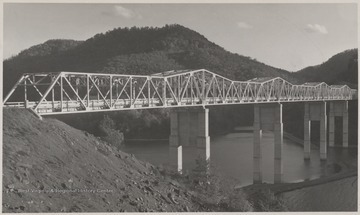 The bridge's name was later changed to "Lilly Bridge". 9. Bluestone High Bridge After Falling, Summers County, W. Va.
Bluestone High Bridge After Falling, Summers County, W. Va.
Parts of the bridge are pictured in the Bluestone River waters below. 10. 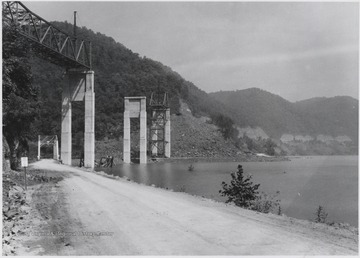 Bluestone Bridge Under Construction at Mouth of Bluestone River, Summers County, W. Va.
Bluestone Bridge Under Construction at Mouth of Bluestone River, Summers County, W. Va. 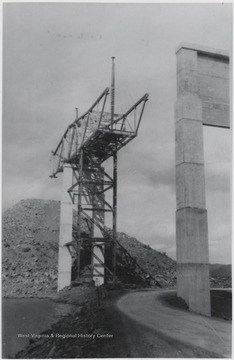 The tall support structure is covered by construction beams. 11. 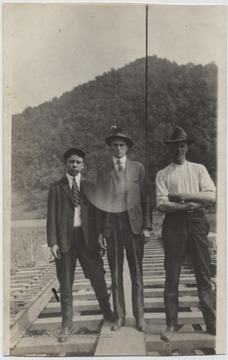 Three Men on First Bluestone River Bridge Construction, Summers County, W. Va.
Three Men on First Bluestone River Bridge Construction, Summers County, W. Va.
Man in the center is Luther Greene. His associates are unidentified. 12. 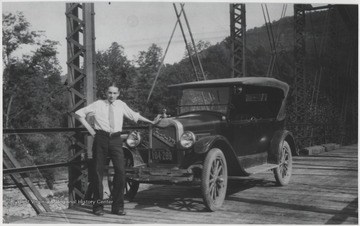 Man and Automobile on First Bluestone Bridge, True, W. Va.
Man and Automobile on First Bluestone Bridge, True, W. Va. 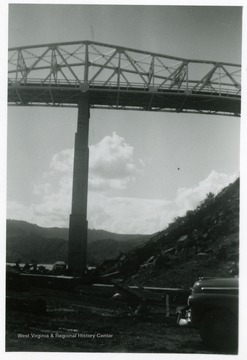 The unidentified man poses beside a car on top of the newly completed bridge over the mouth of the Bluestone River.